FFA - Orlando Jihadist’s wife whose whereabouts was unknown by Attorney General is found by New York Times who publishes different account of her role in America’s worst terrorist attack since 911. America deserves to know what law enforcement intends to do about Noor Salman’s reported knowledge and involvement in the Pulse Nightclub massacre. Will she go free or will she be charged? The email for this article was deactivated after the FBI arrested Noor Salman on January 16, 2017. Omar Mateen killed 49 people and wounded 53 others in a mass shooting at the Pulse Nightclub in Orlando, Florida on June 12, 2016. He was killed in a shootout with the local police. Noor Salman, Omar Mateen’s wife, reportedly knew of his plans and was with him when he evaluated attack sites and purchased ammunition. • Noor apparently had an inkling about her husband's sinister plot after she told the FBI she once drove him to Pulse because he wanted to scope it out. • In addition, she said she was with him when he bought ammunition and a holster, several officials familiar with the case said. A U.S. Attorney plans a grand jury to determine charges that may be filed against Noor Salman. Noor Salman whereabouts unknown according to U.S. Attorney General Loretta Lynch. United States Attorney General Loretta Lynch says she does not know of Noor Salman’s location. Breitbart reported on June 23, 2016: “Right now I do not know exactly the answer to that. I believe she was going to travel, but I do not know exactly her location now.” See Loretta Lynch video. Omar Mateen’s father, Seddique Mir Mateen, who supported the Taliban, ran a campaign for president of Afghanistan and made radical anti-LGBT rants, sat directly behind Hillary Clinton during a campaign event in Orlando. ABC News reported on August 9, 2016: “Seddique Mir Mateen, the father of the man blamed for the Orlando nightclub massacre, attended Hillary Clinton's campaign rally in Kissimmee, Florida, Monday. He's seen in video sitting in the crowd behind Clinton on stage.” Video on this article shows Mateen directly behind Hilary Clinton with other Muslims around him. United States Attorney General Loretta Lynch may not have known (LOL) where Noor Salman was but somehow she was conveniently connected to the New York Times which published a revised version of Salman’s involvement with the Orlando attack and highlighted her alleged status as an abuse victim. The New York Times reported that Noor Salman claims that “I was unaware” of my husband’s plan to shoot 102 people despite numerous accounts to the contrary from law enforcement reported in June 2016. Much of the New York Times article was devoted to reporting Noor Salman’s emotional allegations of being abused by Omar Mateen. Omar Mateen added Noor Salman to his life insurance policy and gave her access to bank accounts just months before the massacre. 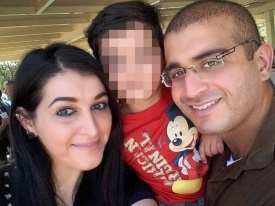 Adding his wife to his life insurance policy and bank accounts should have clearly demonstrated to Noor Salman the seriousness of his plans to kill many innocent people. United States Attorney General Loretta Lynch’s proclamation that she did not know the whereabouts of Noor Salman troubled millions of Americans who have knowledge of the above mentioned news reports regarding her involvement and who desire justice. If the June 2016 media reports regarding Noor Salman’s involvement are accurate allowing her to go free denies justice in this situation and sends a very harmful public safety message to future would be terrorists and accomplices. Florida Family Association has inquired with the FBI, Florida Department of Law Enforcement and Orange County Sheriff on this issue to no avail. Florida Family Association has prepared an email for you to send to the FBI, Florida Governor and Commissioner of the Florida Department of Law Enforcement. The email states that America deserves to know what law enforcement intends to do about Noor Salman’s reported knowledge and role in the Pulse Nightclub massacre and asks for a public report.